Slow Art Day has asked its 2013 college interns to write short summaries of their own experiences looking slowly at artworks of their choosing. 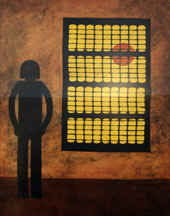 One afternoon, I spend 20 minutes looking at Rufino Tamayo’s El Hombre En La Ventana (1980). At first glance, it appears that the man is only momentarily looking outside the window. But after further observation, I come to believe that this man is not just casually looking but staring as if looking out into the distance, out into the future. As I look more, I reflect on how the style of the piece is important. The style is Mexican – I know because of the style and materials of the blinds. These are traditional Mexican wooden blinds, not conventional American plastic ones. I also begin to think about this Mexican man. Perhaps he is looking to the future because he is a father and has a family that he needs to support. This piece is very simple but seems to suggest a deep topic in a very simple yet impactful way. I stand back and also think about where I am seeing this painting. The Vincent Price Art Museum, in partnership with the East Los Angeles Community College, seeks to serve the culture and history of the Mexican community both in Los Angeles and in Mexico. Through a motif of modernism, this museum and its varying collections offers a new view of modernism that reflects the local community. So maybe this Mexican man is at a window at his home in Mexico or maybe he is here in East LA. As the minutes tick by, I begin to reflect on the moment the painting was created: 1980. The U.S. and many other parts of the world are in recession. Many people, including perhaps this man in the painting, were thinking of moving for jobs. Even within the U.S. a big migration was beginning from the rust belt to the sun belt. I think more about the body language of the man. He has his hands on his hips. I think he is ambitious. He wants control of his future for himself and his family. He is very similar to many other men at this time because they all wanted something better for themselves. I’m amazed at what I’ve seen in 20 minutes. In really looking slowly at this piece of artwork, I have thought about much that would have gone unnoticed. Looking slowly is a great way to truly evaluate and appreciate any artwork and was certainly true for this Tamayo. Next time you are in Los Angeles, I recommend you visit not just the big museums but come to the Vincent Prince and take some time to really see. I love how you incorporate your own knowledge of Mexican culture into your reading of the piece, and that the art of slow looking allowed you to make those connections!